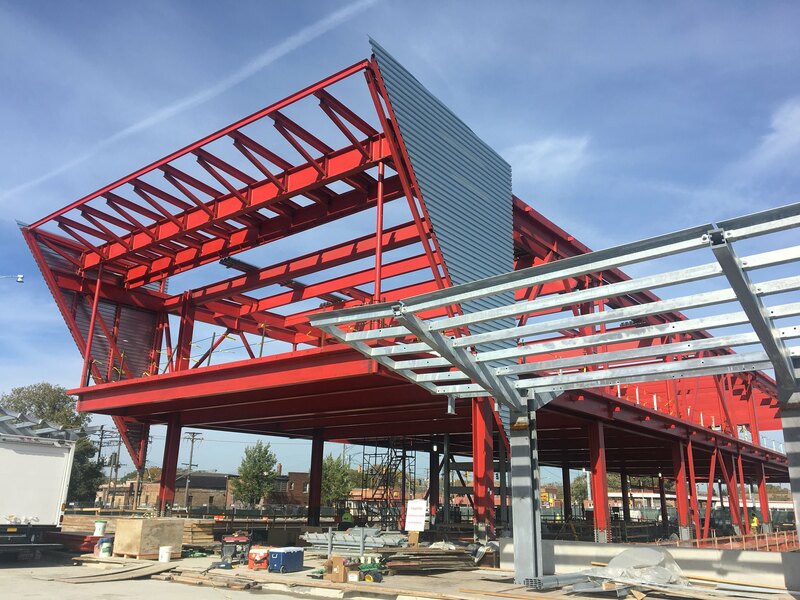 In fall 2014, construction began on the 95th Street Terminal Improvement Project, a $280 million project (projected cost) that will expand and greatly improve the 95th/Dan Ryan station (the south terminal of the CTA Red Line) and bus terminal areas at the station. The project will bring significant improvements to a station that serves thousands of customers each day and is a vital part of the South Side. Built in 1969 and designed by architects at the famed Chicago architecture firm Skidmore, Owings & Merrill, the station serves as both a train terminal and an integrated bus terminal. The station is one of CTA’s busiest, with 24-hour Red Line service and over 1,000 CTA and Pace bus trips on a typical weekday. These buses connect Far South Side communities to the CTA rail network. There are roughly 300,000 people who live within walking distance of the CTA bus routes serving the 95th/Dan Ryan Terminal. The project, one of the largest station reconstructions in CTA’s history, will create a signature station featuring a modern design and myriad customer amenities to improve the overall transit experience. The station represents a significant investment in Chicago’s South Side, and is the latest large-scale project to improve the Red Line, the CTA’s busiest. The station will remain open throughout construction. Construction of the south terminal is scheduled to be completed in 2017, with the north terminal scheduled to be completed in 2018. The 95th/Dan Ryan station is a critical piece of the CTA’s Red Line. It connects Far South Side communities, to job centers throughout the region and serves as a transit gateway for the South Side and suburbs. The rail terminal is located in the median of the I-94 Dan Ryan Expressway and the bus terminal flanks the expressway. The station site is highly constrained, bound by 95th Street on the South, State Street to the east, and Lafayette Avenue to the west, causing bus delays and traffic conflicts, due to limited space. In the current terminal there are only 20 bus bays which must accommodate dozens of CTA, Pace, Greyhound and Indian Trails intercity buses. The station does not currently have direct access to and from 95th Street, a problem that requires pedestrians to use terminal areas for street access, posing safety risks. Improvements are needed to better serve existing high volume of riders, provide safer passenger access to buses and the train station, and expand passenger facilities that will lead to a modern, safe and pedestrian-friendly transit center with fewer delays and shorter travel times. We're also taking advantage of the ongoing terminal construction to make improvements to the complex track and interlocking just south of the station leading into the 98th Street Yard. The work is complex and substantive: replacement of track and all elements in the right-of-way south of 95th Street, up to the 98th Yard. Items to be replaced include a complex interlocking, signal and traction power cabling and duct banks, ballast and other related materials. With track modifications required as part of this project, this is the best time to make any additional track improvements. Doing this track work simultaneous with the station work will limit the need for any service disruptions after the new station is built. This work will help improve the movement of train traffic in and out of the 98th yard and through the 95th Terminal, which services the Red Line—our busiest line. As part of the 95th Street Terminal Improvement project, the CTA has tapped internationally recognized, Chicago-based artist Theaster Gates for the largest public artwork project in the agency’s history. More than just artwork—Gates has created a unique, catalyst program that will foster community engagement, provide jobs and offer training to school students. The two original artworks created under this initiative will be permanently displayed at the rebuilt terminal. This historic project will create 10 new jobs for the production of the artwork and artist apprenticeships, which will promote skills development and training for local students. Gates will also take part in significant community outreach throughout the process, including hosting five upcoming public meetings to engage and promote a dialogue among community residents, architects and designers. Planned for location in the North Terminal, this space will become a DJ booth that provides commuters with real-time audio programming and live music hosted by a regular weekday DJ, featuring DJs in-residence, musicians, poets, and community members. This project was conceived in response to five community engagement meetings with South Side residents. Neighbors responded with a strong interest in developing a living space that would allow for the celebration of past achievements, to showcase current talent, and for the space to be a symbol of hope. And a platform to celebrate local talent, both in the construction and design of the sound studio, in the ongoing implementation of the space by local DJs, and in the development and training of new DJs through workshops on music, sound, and audio production. Two large tapestries, to be located in the South Terminal, are made from colorful strips of decommissioned fire hoses and galvanized steel. The tapestries, signature works within Gates’ artistic practice, are reflections on the importance of the civil rights movement and the struggle and acknowledgement that the work of equity and equality is an ongoing effort not carried by one people, but by all. The overall art project budget is approximately $1.3 million. Of this amount, $1 million is earmarked for the design, fabrication and installation of the artworks; and $50,000 is to cover costs associated with community engagement activities, including public meetings. The artist fee is $250,000. Born in Chicago, Theaster Gates is an artist, cultural and urban planner, and Director of Arts and Public Life Initiative at University of Chicago, Provost Office. Theaster Gates Studio is an internationally acclaimed practice that includes space development, object making, performance and critical engagement with many publics. Gates transforms spaces, institutions, traditions, and perceptions through art practices that combine his training in urban planning and sculpture. The Wall Street Journal recognized Gates as Arts Innovator of the Year and he was honored as the Commissioned Artist of the New York Armory Show and featured at Documenta (13), the international art festival in Kassel, Germany. Currently, an exhibition of his artwork, Theaster Gates: 13th Ballad, is featured at Chicago’s Museum of Contemporary Art. In 2012, Gates was awarded the inaugural Vera List Center Prize for Art and Politics and was also named the USA Kippy Fellow. Gates is also a 2012-13 Creative Time Global Resident. Please email your comments and questions about this project to 95thTerminal@transitchicago.com.